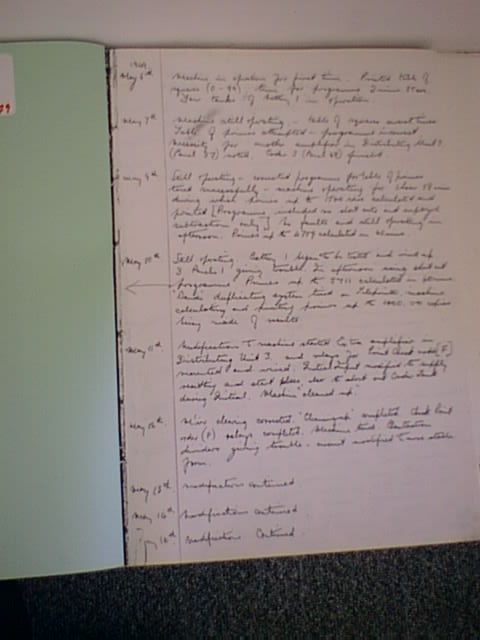 This part of the log was written by William S. Renwick, chief engineer of the EDSAC Project headed by Maurice V. Wilkes. Later parts were written by other engineers, users, and operators. Machine in operation for first time. Printed table of squares (0-99), time for programme 2 mins. 35 secs. Four tanks of battery 1 in operation. Machine still operating, - table of squares several times. Table of primes attempted - programme incorrect. Necessity for another amplifier in Distributing Unit 3. ( Panel 37 ) noted. Coder 3 (Panel 68 ) finished. Still operating - corrected programme for table of primes tried successfully - machine operating for 1 hour 58 mins. during which primes up to 1500 were calculated and printed [Programme included no short cuts and employed subtraction only.]. No faults and still operating in afternoon. Primes up to 4759 calculated in 40 mins. Still operating. Battery 1 began to be tested and wired up. 3 Panels 1 giving trouble. In afternoon using short cut programme Primes up to 5711 calculated in 60 mins. "Banda" duplicating system tried on Teleprinter, machine calculating and printing primes up to 1000, 50 copies being made of results. Modifications to machine started. Extra amplifiers in Distributing Unit 3 and relays for the print check order [F] mounted and wired. Initial Input modified to supply resetting and start pulses, also to short out Order Tank during Initial. Machine " cleaned up". M'ier clearing corrected. "Cleaning up" completed. Check Print order (F) relays completed. Machine tried. Phantostron dividers giving trouble - circuit modified to more stable form. Demonstrations of squares tape in afternoon. Half-adder giving trouble. Trouble with right shift - no "ones" being added when number negative. Right shift corrected. Machine operating. Primes from 7 tape tried - [programme wrong ?] First battery wired up ready to try. Monitors more permanently wired. Coder III tested and wired in. Breakthrough of input to wrong tanks traced. -[ due to parasitics ?] Grid stoppers increased to remove oscillations. Due to delays in amplifiers in Transfer Units a 1 minor cycle tank in Transfer necessary. Modifications to Transfer unit carried out. minor cycle tanks. Mods carried out to Transfer Unit. Transfer unit modified and wired in, also 1/2 adder in F order tank. Machine operating. Co-ordinating orders tried ( O.K.) Print squares ( 2 routines ) and primes from 5. ( All O.K.) Teleprinter line feed sticky also carriage return. Preparations for demonstrations begun. Distributeing Unit VI ( p.51) cleaned up in morning , also Teleprinter oiled etc. Squares tried in morning (O.K.). E/P relay Output changed. Sticking troubles. Machine operating well. EF55 in D.U. VIII down. Sticking relays. 1st European computer conference ! Modifications to Input and Output E/P system. ETC. The margin note appears to have been added later. A set of 16 mercury delay lines each used to store 16 35 bit words. The EDSAC commissioning started with 4? mercury delay lines, giving 64 full words. The full set was two batteries. An electonic chassis wired into a rack. It contained 10-20 valves, the only pluggable units. The EDSAC had three rows of racks, each row had three or four racks and each rack had up to ten Panels. Another name for a single mercury filled delay line. An abbreviation for Multiplier Unit. End pulse used to start the next order, For input and output it was derived from a mechanical contact which caused design problems. (USA Tubes ) An electronic amplifying device. A cylinder about 1 inch in diameter and 2 inches long, with up to 8 pins at one end for plugging into a socket. They had a life of a few thousand hours. A valve made by Mullard, used in EDSAC. A resistor connected to the grid of a valve intended to prevent parasitic oscillations.